I love this game and I had been playing it since I was four years old! (With my sisters of course). And I still love it, but it just made me confused when it says that I have 21 hours. So I thought that if it was 6:00, I would basically have about another day/mourning to wake up, but after a few hours I looked at the quest page and it said that I have 1-2 hours left!!! And when I came back to the app, after a few minutes, it said that the time was out. But I still would rate it five stars! The Wedding Present Event was very disappointing. All of the items are just for show, no actions. It would have been great if the Sims could have use the knife set or pour wine for friends. Also, I would like a bakery event where we can build our own bakery and serving treats to children and adults. Example: If my sim bakes cookies, my sim can sit them on a counter for adults to grab or handle one to toddlers; preteens and teens can serve themselves. 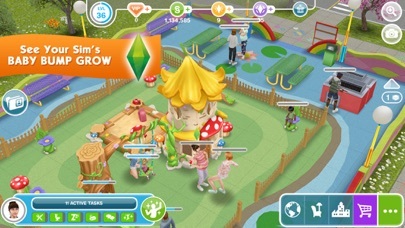 Also, it would be nice if the sims could do more with the baby sims like take them to the park in a stroller, hold baby in the pool, take baby to doctor, give baby teething toy, etc. 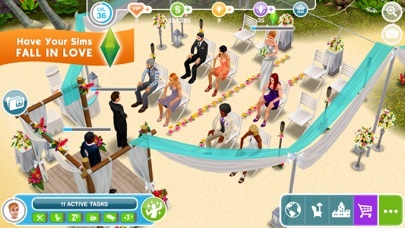 Please provide more actions for married sims like cuddling on the couch, rubbing feet, holding hands, fun interactions. Thank you. I haven’t played this game in about 6-8 months because it got boring quickly, but when I decided I would play this for about 10 minutes. I quickly started facing problems and I only played for 5 minutes. First, the day I stopped playing I was doing a quest and made my Sim do the action for the quest. I’m almost sure I made the Sim do the correct action. It didn’t work. I ignored it and thought it was a bug that could be easily fixed. Then I took one of my Sim families to the Sunset Mall. I wanted an adult to swing on a see-saw with a toddler. But instead it gave me an advertisement. I skipped it, but I was starting to get a tiny bit annoyed and bored. But I kept on playing because I wanted to see if it would get better. I had a family that I really loved who had a baby practice walking. I haven’t played this in a while, so I forgot that you don’t have to sit down a baby on the ground to practice walking. 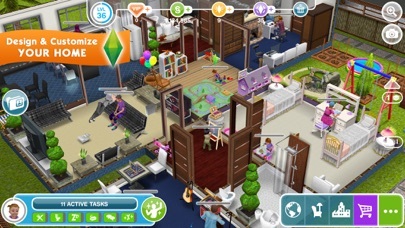 The baby was teleported to her dad’s house, because there was too many Sims there. When I went to check on the baby, she was at the house, but I couldn’t find her. I soon found her, but she was in a place NO Sim could walk to, but somehow the infant was stuck there. PLEASE fix this, EA! If you don’t respond I’ll contact you again, but if you still don’t respond, I won’t play anymore of your Sim games, and that’s a promise. The game itself is pretty boring anyways, so why did I even keep it? Well, that’s my first time back experience with this game, it was pretty bad, and I hope no other players go through this. PLEASE PLEASE PLEASE, contact me if you find a way to fix it!!! The game is good but.. I do enjoy the game but it’s so hard to be interested in a game when there’s always an ad popping up every 5 seconds. Like I can barely achieve anything with ads popping up every 5 seconds. Please fix. Many people want to enjoy a game without being Interrupted. I don’t see the reason for so many ads. I mean how would you feel playing a game you enjoy but have ads always popping up every 5 or more seconds. 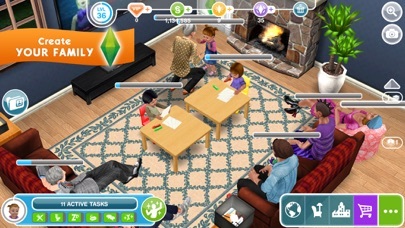 I used to play the sims on a pc, which was fun. This was about as fun as watching paint peel. 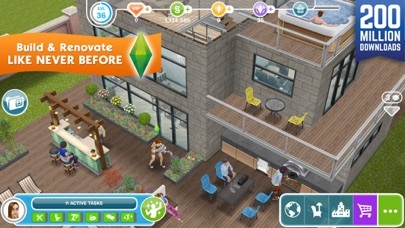 The whole waiting game for your sims to complete activities is designed to make you spend money Save your time and money, find another game.